Res Extensa is a tape piece based on the superposition and juxtaposition of different layers of sound or registers. These registers are layers of sound materials related to our everyday sound environment and coming from different origins: marginal sounds from electric devices, analogue sources, field recordings, amplification of micro-sounds, recordings of machine noises, digital errors and music. These sounds do not carry a traditionally codified expressive meaning but rather an emotional register linked to our everyday experience, an affective and tactile charge related to what we are exposed to. Within them, a great variety of articulations and nuances are connected to our feeling and understanding (of the world). The aim of the piece is to unfold, friction and break up this matters to expose them in their affective characters and our connection to them. Recorded sound can be though of as a specific kind of acoustic event. This, as well as the sounds of all kind of electric phenomena, have become part of our listening culture. The fragments used in Res Extensa, different levels of recorded sound, are not a representation of the world but rather extracts of our vibrational experience, of our shared surface of perception, feeling and thought. The idea is to create a musical event based on the assemblage of different modes of listening. In âRes Extensa sound matters and their implied listening habits are put against each other. The idea is to build a dramaturgy of the grain of sound in which each layer unfolds an array of sensations, a plane of continuous movement stripped of the acquired mechanisms of perceiving musical sound. Music as a language of matter, but language as an articulation of experiences rather than as a representative system. 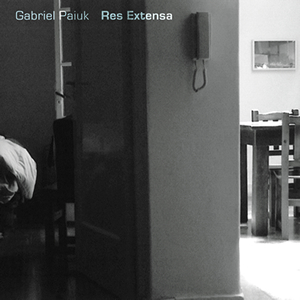 Gabriel Paiuk is a composer, pianist and improviser was born in 1975 in Buenos Aires. In 2004 the Kammerensemble Neue Musik Berlin premiered an ensemble piece at the Berlin-Buenos Aires Metropolenprojekt 2004 at the Podewil, Berlin. In 2003 he was composer in residence at the CETC (Experimental Centre of the Colon Theatre, Buenos Aires) at the Instant? project and has presented pieces at the British Arts Centre, Centro Cultural Ricardo Rojas, Museo de Arte Moderno de Buenos Aires and Experimenta 2000 Festival. He has taken part in groups devoted to free improvisation performing regularly in Buenos Aires, Europe and USA, together with Andrea Neumann, Jason Kahn, Axel Doerner, Burkhard Beins, Rhodri Davies, Matt Davis, Ricardo Arias, Lucio Capece, Robin Hayward, Julia Eckhardt, Sean Meehan, John Russell, Sergio Merce, Manuel Mota and Ernesto Rodrigues. He is an stable composer of the �La Otra� dance company since 2001.